Alexandre del Valle is an Italo-French lecturer on geopolitics and a researcher for Università Europea di Roma, Institut Choiseul and Daedalos Institute of Cyprus. He specializes in radical Islam, terrorism, and relations between the West and the Rest. He has been an editorialist in Le Figaro, Le Figaro Magazine, France Soir, Israel Magazine, La Une, Il Liberal, etc., and has had articles published in geopolitical magazines and reviews such as Politique Internationale, Herodote, Outre Terre, Geostrategics, Stratégiques, Geopolitical Affairs, Nova Storica, Il Liberal, and many others. Apart from being a geopolitician, he is — together with Rachid Kaci — the founder of the liberal-conservative Right (“Droite Libre”), whose slogan is: “Secularity, defence of the West and Freedom, and struggle against political correctness”. His analysis has influenced French, Spanish and Italian politicians, especially the French party UMP. He is the author of nine books. 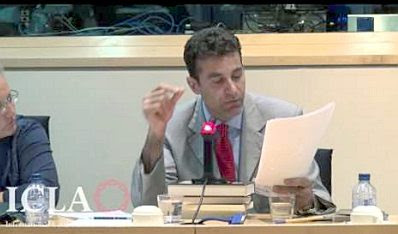 Below is the prepared text of the speech given by Alexandre del Valle at the Brussels Conference on July 9, 2012. The video of his speech is available here. I want to thank the European Parliament and ICLA to welcome us here. And before making my own speech, I also want to transmit to you the apologies of Bat Yé’or, who cannot be here with you today because her husband, David Littman, recently passed away in Switzerland further to a long illness. I can testify how courageous and consistent David has been in defending democracies and fighting for freedom of expression at the Human Right Council of the United Nation of Geneva for 20 years, against red-brown-green dictators. David gave a lesson of courage and dignity. In effect, just before dying, and though he was suffering a huge cancer for two years, he recently published his last book dedicated on the “Persecutions of Jews under Islam and dhimmitude”. Bat Yé’or herself, in spite of the pain of her husband’s illness, also recently published her latest book: Globalization, Europe and the coming Caliphate published in the USA in 2011. The objective of my presentation is to explain the role plaid by the Organization of the Islamic Cooperation, OIC, and its several attempts to try to ban freedom of expression on Islam across the world. 3. Third I will finish with the “Istanbul process” and the western reaction against OIC anti-freedom and theocratic agenda. What is OIC and its goals? The OIC is one the most important intergovernmental organizations of the world. It groups 57 Muslim countries and aims to defend Muslim interest and to develop a political Islamization all over the world. Its main leaders are Saudi Arabia, Pakistan, Kuwait, Turkey, Egypt. First, to Re-Islamize Muslim countries and submit Muslim regimes and populations to Sharia. In this OIC global framework and theocratic strategy, I think that the “Arab spring” was a huge success for OIC and Islamist dictators because many secular regimes were removed and sharia progressed; That fore, I always say that the first victims of Radical Islamism are Muslims, Muslim normal citizens, Muslim freedom fighters, Muslim women, Muslims seculars, and Muslim minorities, often forgotten by the West. Second, to Islamize the West, using Muslim immigrants and avoiding their integration to Western unbelievers’ rules (what I call “voluntary Islamic apartheid”). Therefore, the Western alliance with Sunni theocratic regimes such as OIC leaders is for me a suicide alliance. The first victory of the OIC was the proclamation, in 1981, of the “Universal Islamic Declaration of Human Rights” aiming that sharia must prevail over secular laws and over the Universal Declaration of Human Rights of 1948. In 1990 the OIC adopted, in Cairo, a new “Universal Islamic Declaration of Human Rights in Islam”. Its Preamble insists more clearly on the superiority of Islamic law over civil rights and freedom of expression. Although those two Islamic Human Rights Declarations had no binding effect, this constituted a real victory for the OIC because the UN legitimized these sharia-based Declarations. The second step of the OIC plan has been implemented successfully inside of the United Nations since 1999, when the OIC began to promote the concept of ‘defamation of religions’. This concept is a serious threat to our democratic values because it aims at restricting freedom of speech as a way to “prevent intolerance” and religious hatred. It strangely compares the right to criticize Islam — a religion — to a racist crime and to ethnic hatred or insult. Everybody know and understand that a religion is not a race, but the strength and the efficiency of this confusion made on purpose by Islamist activists and their leftist allies is based on the fact that any kind of critic against Islam is penalized and targeted as “racist”, even in Europe. Inside the UN Human Right Council and the OIC, Pakistan has been the most active promoter of freedom-killing resolutions and of the strange and dangerous concept of “Islamophobia”. In 1999 Pakistan presented to the HRC a resolution on “defamation of Islam,” which was later adapted to include all religions (“defamation of religions”). But the texts adopted by the HRC clearly denounced only “Islamophobia”, concept created by Ayatollah Khomeini in 1990 in order to justify a death sentence against Salman Rushdie and after that to blame and crucify the so-called “Western Islamophobes”. Huge paradox: We can notice that the main supporters or “Defamation of religion” are the most intolerant and Christianophobic states of the world, such as Saudi Arabia or Pakistan! Those totalitarian fanatic regimes who kill “apostates” and persecute Christians and non-Muslims are poorly placed to give moral lessons to democracies! For instance, let’s remind that Pakistan’s Penal Code condemns to death blasphemy, blasphemers, “apostates” and non-Muslim minorities who “insult Islam” or are proselytes. However, in 2001, the former Commission of Human Rights adopted a resolution against “Defamation of religions” and “Islamophobia”. One of the objectives was to adopt an international resolution against Islamophobia which would impose deterrent penalties on those who dare to criticize Islam or denounce Islam legal sharia violence. In March 2007, a non-binding resolution, that named Islam as the only religion concerned, was accepted with a majority of 108 votes. The text denounced the fact that, after September 11th, Islam was too often associated with terrorism, violence and human rights violations. We must underline this perverse strategy: instead of engaging in self-criticism and fighting against the legal sharia roots of Islamo-terrorism, the OIC used the September 11th’s tragedy as a new pretext to make the West feel guilty by accusing them of “crucifying Muslims” and by introducing a “clash of civilizations”. It’s also why the United Nations created the “Alliance of Civilizations” to fight against what Samuel Huntington called the “clash of civilizations”. In fact, this so called “alliance of civilizations” groups many anti-democratic and Islamic regimes such as Iran or Turkey, and the Western democracies who share a common “appeasement policy” and volunteer dhimmitude toward the hostile Islamic and anti-Western world. Strangely, the West feels guilty for this “clash of civilizations” attributed to American “neo-cons” and defenders of the West, but the main ones responsible for it are the anti-democratic “Red-Brown-Green” States who want to destroy universal human rights and open societies by blaming the West for everything and by spreading a hatred ideology against European and American civilization itself. In March 2008, in this “post Cold War” and anti-West framework, a new step, much more serious, has been made when the higher body of the UN adopted this OIC resolution. The General Assembly declared to be deeply “hurt “ by the defamation of religion and Islam all over the world and specifically in Western democracies” (with the pretext that Iraq and Afghanistan wars were “Islamophobic” and “genocides” against Muslims), but did not say a word of Christians genocides in south Sudan in the same period. In the name of a subversive conception of tolerance, the OIC requested that western democracies introduce in their civil law a penalization of “Islamophobia”. As the great Western thinker Sir Karl Popper said before us, Tolerance has been used by Intolerants to destroy the Tolerant societies in the name of Tolerance. In 2009, 23 countries voted in favor of the Resolution. In 2010, another similar Resolution was adopted by the Human Rights Council. (condemning the Swiss popular initiative banning minarets). In June 2010, speaking on behalf of the OIC, Pakistan demanded that the UN Human Rights Council take strong action against “Islamophobia” in the West. Surprisingly, in June 2011, after many years of resistance against OIC concept of “Defamation of religions” (and thanks to people like David Littman and Roy Brown) a Human Rights Council Committee decided to abandon the concept of “defamation of religions”. This UN Committee was composed of 18 independent “high level” experts who concluded that anti-blasphemy laws, such as those implemented in Egypt, Saudi Arabia or Pakistan, violate Human Rights. But the “defamation of religion” and “Islamophobia” concept were reformulated by OIC and using other terms with a new Resolution (named “16/18”), presented in the Human Right Council and adopted by consensus on 19 December 2011. This 16/18 Resolution aimed the same killing-freedom objective, but indirectly, by “fighting against intolerance, negative stereotyping, stigmatization, discrimination, incitement to violence and violence against individuals because of their religion or belief". It did not use any longer the term “defamation of religions”, but another expression more astute : “basis of their religion or belief” which means in fact exactly the same thing. This new formulation emphasizes protection of people, and no longer the religion itself, as it had been rejected before. After that, a new strategy to implement the “16/18 Resolution” was conceived by Turkish OIC General Secretary Ihsanoglu, who decided to hold an international meeting in Istanbul in July 2011. This new OIC “Istanbul Conference” aimed to ban any critics of religions and Islam under the pretext of fighting the “intolerance against religions”. “OIC has been consistent at emphasizing the importance of the limits to the right to freedom of opinion and expression, in a structured multilateral framework, and in the light of events like the burning of Quran according to the “test of consequence”. What is the “Test of consequences”? It’s a very dangerous concept, because it makes guilty for Islamic violence not the Muslim fanatics who kill blasphemers or anti-Islam thinkers, but the caricaturists or Islamophobes themselves, such as Danish cartoonists or Theo Van Gogh: all those who “provoke” the violent reaction of Muslims by “hurting their beliefs”. “We call for a global awareness on the dangerous implications (consequences) of the rise of Islamophobia on world peace and security. We emphasize the need to develop, at the UN, including the HRC, a legally binding institutional instrument to promote respect for all religions and cultural values and prevent intolerance, discrimination and the instigation of hatred against any group or followers of any religion”. After the first Istanbul meeting, in December 12-14th, 2011, the OIC met the Obama Administration in Washington in order to convince American President Barack Obama to adhere to this “Istanbul Process” and to implement the 16/18 Resolution adopted on March 24 2011 in Geneva. With an Hillary Clinton’s official verbal approval, the OIC scored a diplomatic important coup. Now, following the Obama Administration, the European Union now plans to host the next Istanbul Process, scheduled for July 2012. What about European Union? What can we do? Firstly, Europe must say no to any kind of limitation or penalization of the right of criticizing any religion! Even as a believer, I’ll never support any law who limits the right of any one to criticize my religion, because everyone must be able to express his own thinking on any ideology or religion. We can and we must block this process as it has been once blocked in 2010-2011. This must be stopped by all democrats, freedom fighters, secular leaders, human rights defenders, at the UN, the EU, etc. I think that the Members of the European Parliament can play a very efficient role by rejecting this freedom- killing new step of the OIC plan. Secondly, we must use the same efficient weapons as radical Islamists, OIC strategists and their politically- correct allies, “leftists” or “do-goodists”. We all know how this is fake and not true, but their semantic war has been efficient since the 1960s… and paralyses the old West and Europe that feels guilty about its past and its present. First, though many of us are secular, non-Christians, non-Muslims, Jews or atheist, we must act with the same weapons as OIC by blaming Islamic countries for persecuting, killing, putting in jail, or committing genocide on so many Christians, non-Muslima, liberal Muslims-apostates, and show at the UN, the EU and all international bodies, that OIC and Muslim countries just blame western Islamophobia and penalise any critics of Islam in order to hide the fact that they persecute their minorities. This mirror accusation based on hiding their Christianophobia by accusing the west of being “Islamophobic” aims to prevent any non-Muslim reaction toward the Islamic OIC goal to conquer and Islamize humanity. Second, we must use or “reverse” against our opponents what the important German-American Jewish philosopher Leo Strauss called in 1953 the “Reductio ad Hitlerum”. The Reductio ad Hitlerum consists in blaming, demonizing and crucifying the other by accusing him of being “fascist, Nazi”, racist, or “acting like Nazis”, etc. Against this Leftist-Islamist permanent accusation, we should more often remind the important alliance between Palestinian movement, Muslim Brotherhood, Muslim-Arab regimes and Nazis, neo-Nazis, and “negationists” since the 30s until now. We should remember that the Muslim Brotherhood, former Egyptian president Abdel Nasser, and many Islamist political parties such as Hamas admired or still admire the Grand Mufti of Jerusalem, the most important Arab-Islamist leader who was a personal friend and ally of Hitler. We must answer that Saudi Arabia, Iran, Lebanon, Syria, Iraq, Pakistan, Hezbollah, Hamas, and even “pro-Western” Turkey have been since the end of the Second World War the main promoters of negationist, Nazi, anti-Semitic publications, doctrines and hatred ideas. We must show that when Islamists or their leftists allies pro-Hamas and pro-Hezbollah present themselves as “the New Jews” persecuted by the “New Nazi-Israeli State” and by their “Imperialist American Allies”, they just insult the Jewish Holocaust, Jewish memory and Jewish history. The conclusion and the reality is that Radical Islamism is the New Nazism, the Third Totalitarianism, the New Global Fascism, the most efficient Hatred System, the most terrible anti-Semite totalitarianism, the most racist and imperialistic ideology. And the victims of this Massive Destruction Ideology are first Muslims who live under threat and terror, second Christian and non-Muslim minorities. On the contrary, anti-Jihad freedom fighters, Asia Bibi supporters, anti-Sharia fighters who want to free Muslims and non-Muslims who live under Islamo-totalitarian regimes are the real new resistance. They are not anti-Muslims, but they are in favour of open societies, tolerance, and they fight any kind of new fascism and dictatorship, even if this new fascism hides itself behind a religion. We must be sure of ourselves. Open societies must now stop justifying themselves. On the contrary, we must react and make them feel guilty. We must request to their governments that they apologize for the genocides and the crimes they are committing against so many Christians, “pagans”, atheists, “apostates”, “blasphemers” in Saudi Arabia, Turkey, Iraq, Egypt, Pakistan, Sudan or Nigeria.